My spiritual journey began in 1987 when I visited the New Delhi, India compound of Radha Soami Satsang Beas (RSSB). We had Satsang and meetings with Master. See my essay Q & A from my book en.light.en.ment (see also my blog 465). As a part of my studies of religions (UNITY) I revisited Sant Mat; I had drifted from “The Path” over the past couple of decades; for some years now I've been enthralled by the teachings of Jiddu Krishnamurti ... who teaches not to follow a teacher. What lead me to Sant Mat in the beginning was the book The Path Of The Masters, by Julian Johnson (a comprehensive statement of Sant Mat, the teachings of spiritual masters). What attracted me were the concepts behind its main objective ... to promote a sense of brotherhood and communal harmony for the betterment of humanity, where the Sants appear more as a diverse collection of spiritual personalities than a specific religious tradition. Radha Soami Satsang Beas is a philosophical organization based on the spiritual teachings of all religions, dedicated to a process of inner development under the guidance of a spiritual teacher. They presented the idea that true religion was a matter of surrendering to "God, who dwells in the heart". Maharaj Charan Singh Ji (1916 - 1990) was the Satguru and head of Radha Soami Satsang Beas at the time I visited. It was he who I had my Q & A with, the result of which was my initiation into the spiritual path and which was at the beginning of my writing of essays which then culminated in my book. I was attracted to the concept of a living Master, as opposed to a deity or a long dead authority figure and I owe a gratitude to the Master for my awakening. The reason I diverted from the Sant Mat path is that while I first deemed it rather much a secular philosophy, I soon realised the teachings are deeply steeped in a belief in a Supreme Being (Radha Soami), i.e. God. In the end this dogma did not agree with my beliefs. Go to the Radha Soami Satsang Beas website for info and watch an introductory video. Furthermore, following is a summary of Sant Mat, as per Wikipedia. The expression "Sant Mat" literally means "Teachings of the Saints" - the "Path of Sants (Saints)", "Path of Truth", "Right or Positive Path". As "point of view of the Sants", the term Sant is pivotal. Derived from the Sanskrit sat and has overlapping usages (true, real, honest, right). Its root meaning is "one who knows (is) the truth" or "one who has experienced (merged into) Ultimate Reality." The term 'sant' has taken on the general meaning of "a good person" but is properly assigned to the poet-sants of medieval India. The Sant Mat movement was not homogeneous, and consisted mostly of the Sants' own socio-religious attitudes, which were based on bhakti (devotion) as described in the Bhagavad Gita. Sharing as few conventions with each other as with the followers of the traditions they challenged, the Sants appear more as a diverse collection of spiritual personalities than a specific religious tradition, although they acknowledged a common spiritual root. The boundaries of the movement were likely not sectarian and were devoid of Brahmin concepts of caste and liturgy. They referred to the "Divine Name" as having saving power, and dismissed the religious rituals as having no value. They presented the idea that true religion was a matter of surrendering to God "who dwells in the heart". The Sant tradition is the only one in medieval and modern India that has successfully crossed some barriers between Hindu and Muslim blocks. Radha Soami Satsang Beas (RSSB) is a philosophical organization based on the spiritual teachings of all religions, dedicated to a process of inner development under the guidance of a spiritual teacher. RSSB was established in India in 1891 and gradually began spreading to other countries. Today RSSB holds meetings in more than 90 countries worldwide. It is a non-profit organisation with no affiliation to any political or commercial organizations. The philosophy teaches a personal path of spiritual development which includes a vegetarian diet, abstinence from intoxicants, a moral way of life and the practice of daily meditation. There are no rituals, ceremonies, hierarchies or mandatory contributions, nor are there compulsory gatherings. Members need not give up their cultural identity or religious preference to follow this path. At the core of the RSSB philosophy is a belief that there is a spiritual purpose to human life - to experience the divinity of God, who resides within all of us. It is through this experience that we will realize the truth of the concept that there is only one God and we are all expressions of his love. Central to the RSSB philosophy is a spiritual teacher who explains the purpose of life and guides and instructs members in a method of spirituality based on a daily meditation practice. The present teacher is Baba Gurinder Singh, who lives with his family at the main centre in northern India. By performing the meditation practice according to the teacher's instructions, individuals can realize the presence of God within themselves. It is a solitary practice that is done in the quiet of one's own home. Members commit themselves to a way of life that supports spiritual growth while carrying out their responsibilities to family, friends and society. To build on the primary spiritual practice of meditation, members are lacto-vegetarian, abstain from alcohol and recreational drugs, and are expected to lead a life of high moral values. The lacto-vegetarian diet encourages respect and empathy for all life and acknowledges that there is a debt to be paid for taking any life unnecessarily. Abstaining from intoxicants improves one's ability to concentrate and calms the mind during meditation. Members are encouraged to be self-supporting and not be a burden on society. They are free to make their own choices in life and maintain any cultural or religious affiliations they choose. RSSB does not involve itself in the personal lives of its members. Maharaj Charan Singh Ji (Sant Charan Singh Ji Grewal, 1916 - 1990), Satguru and head of Radha Soami Satsang Beas, was named successor in 1951, following the death of Sardar Bahadur Jagat Singh Ji. 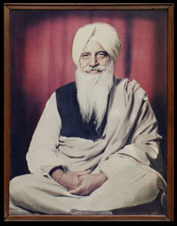 He served the Beas sangat for almost four decades, until his death in 1990 at the age of 73. Before his appointment he practiced law in Hisar and Sirsa, India. He was an initiate of Baba Sawan Singh, his paternal grandfather and predecessor of Sardar Bahadur Jagat Singh. Charan Singh Ji Maharaj assigned the duties of successor and guru to Baba Gurinder Singh Dhillon, his initiate and nephew.